The best convertible travel dresses allow you to create many different looks from just a single piece. This allows you to pack light because you won’t have to pack as much. We have rounded up our favorite travel dresses that will help you pack light and stylishly! Convertible travel clothing typically can be pretty lackluster and unappealing. Trekking pants anyone? It hasn’t been until recently that we travelers have finally gotten a glimmer of hope for our travel wardrobes. These are among the best convertible dresses for travel, providing you with a perfect balance of form, function, and fashion. Some of these dresses are reversible, which means they have fabric on both sides. Others are reversible in that the “back” and “front” can be worn either direction. Some are convertible, changing from a top to a skirt to a dress. All of them are versatile and offer travelers plenty of options for different looks from a single item! Versatility is key to a capsule wardrobe. Learn more in my guide! Tip: Use packing cubes to maximize the space in your bag. Check out my packing video tutorial. The ExOfficio Wanderlux Travel Skirt only has two functions, but it’s a great item to add to your travel wardrobe. It acts as a dress and a skirt and is super comfortable. You can accessorize this cute dress with a belt for a more dressed up look or you can just wear it on its own for a relaxed bohemian feel. An ideal dress for small villages, long transport days, and just hanging out, the practicality of this convertible skirt or dress, short or long, makes it appealing in a variety of settings. Find it in various patterns and colors to perfectly fit your style! Read these carry-on packing tips for a sample plus-size travel wardrobe! Every clothing line has something special that makes them unique and for Vacay Style, it’s definitely their two-piece travel dress sets. They call them their MAXi dresses, I think they’re genius! What’s better than a maxi dress for travel? A style that lets you make several outfits not just one. And that’s the concept behind Vacay Style’s two-piece dress sets. 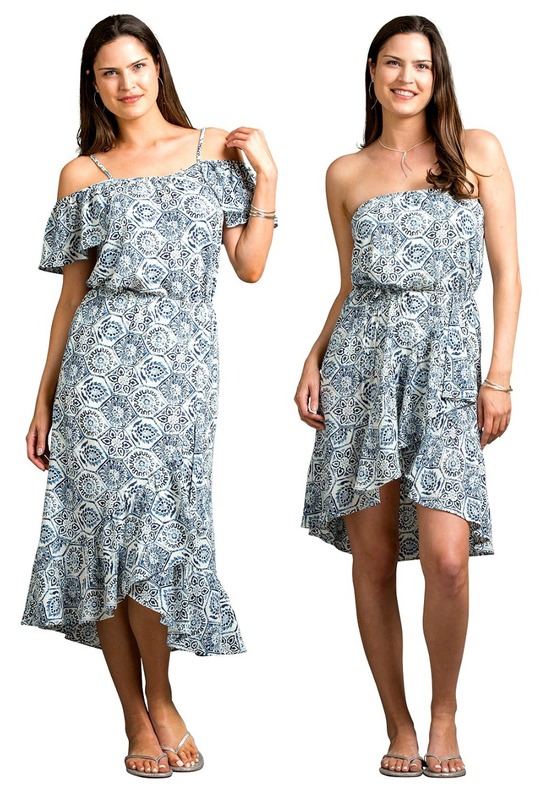 The ultimate two-piece dress has function meet fashion, and you get the benefit of the relaxed, feminine fit of a maxi with the additional option to wear the separates as a top and skirt. With nine two-piece dress sets to choose from, your travel wardrobe just got a convertible fashion makeover! Read my review to find out why I love two-piece dresses for travel! Every woman loves a circle scarf for travel. They’re convenient and versatile. Plus, they add a little flavor to a basic outfit and can also provide warmth from the cold or protection from the sun if needed. Now, imagine a circle scarf that also transforms into a dress with the push of a button? Well, in the case of Encircled’s Chrysalis Cardi, it transforms by the snap of a button! How does this unique convertible clothing work? The Cardi is a tube-like fabric that conceals clever buttons around the rim that allows you to use it as a scarf, a convertible wrap dress, and a cardigan, too. In their description, they claim it can transform into eight unique items. But guess what? I found even MORE ways to wear the Chrysalis Cardi! Read my review to learn more about the convertible wrap dress you can actually wear everywhere! This dramatic style of the Norma Kamali dress goes a step away from the traditional convertible travel dress. We love the asymmetrical length and think it’s one that can work on both petite and taller women alike. While on the pricier side, its high-quality black stretch jersey and impeccable draping will ensure you look like a star no matter how you wear it. Follow our Minimalista or Travel Essentials Packing Lists to downsize your travel wardrobe even more! Mirror Reversible Dress by Toad and Co. It doesn’t get much easier than this. If you don’t feel like fussing around with straps and silhouettes, opt for a reversible travel dress to do the work for you. Simply flip inside out for a brand new color or print to rock (and don’t forget the accessories). It comes in a variety of color and pattern options so you’re sure to find one you like. In addition to being eco-friendly, we’re obsessed with how versatile Toad & Co.’s Mirror reversible dress is! Watch my Facebook Live on the Best Convertible Dresses for Travel! Travel with one of the latest and greatest convertible dresses on the market, TwelveWays. This brand is well on its way to becoming the must-have item in every girl’s backpack. One simple and basic item of women’s clothing can convert into a top, dress, and skirt. TwelveWays also provides you with additional styles with each transformation of this convertible dress for travel. It also comes in lime, stone blue, and, of course, classic black. If you’re looking for a feminine and fun dress with lots of looks, then this one’s for you! Read my review of the TwelveWays convertible travel dress! One of the most popular questions readers ask us on Travel Fashion Girl is: “Where can I find stylish yet practical reversible clothing for travel?” My response: Helene Clarkson. The Sabi travel dress is particularly special because it’s reversible, and you don’t need room to change the look. Turn it around and tie a knot at the back of your neck for a different style. Two for the price of one – bonus! And, because it’s a “reversible” clothing item that is not double-sided – you don’t have to worry about adding unnecessary bulk to your luggage. This dress makes packing light easy. Check out Helene Clarkson’s other reversible clothing options, including sweaters, tops, skirts, pants, and jackets. Diane Kroe is the queen of transformation! She’s best known for her feminine collection of convertible clothing for travel. The line has over 20 jetsetter-friendly pieces, including tops, dresses, wraps, and pants – and the best part is: they’re all versatile. This pretty dress comes in six colors and is flattering for all types of figures, but particularly curvy women. I had a chance to check out two of her multi-way items: the Wanderlust Wrap and the Endless. Read my review here! 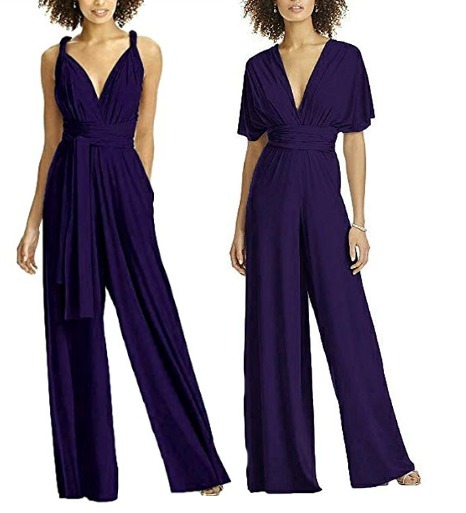 Want to rock a fabulous jumpsuit instead? This stunner makes not just one — but SIX — outfits in an instant. This multifunctional clothing is perfect for a night out in a new city as you grab cocktails and go see a show. This particular style jumpsuit comes in sage or red, if you really want to make a statement! Which of these convertible travel dresses do you prefer? Share and comment below! 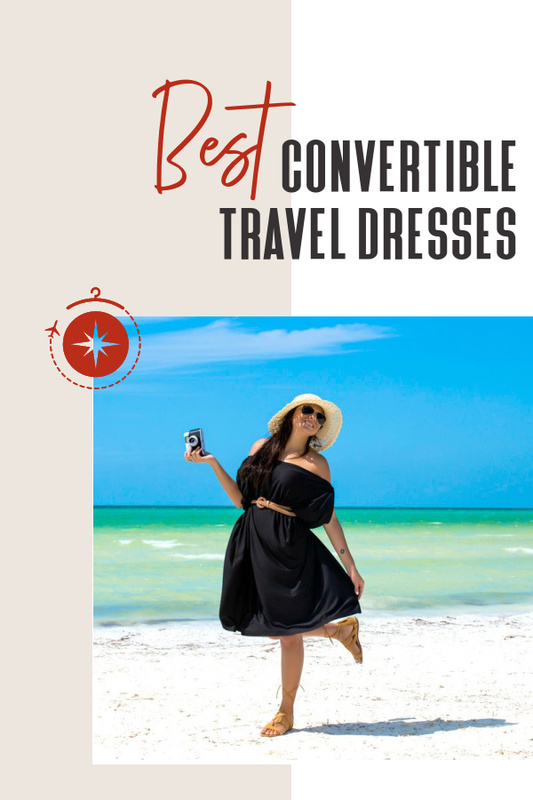 I hope you liked this post on the best convertible travel dresses. Please share with your friends on Facebook, Twitter, and Pinterest. I would like to ask on behalf of many: what about women over 60?? I hope that we are not doomed to sit in a chair and knit…. We travel too, perhaps you know. And some of us do not wear trousers because our figures are not the same as they were at the age of 29. We would welcome tips for travel dresses. Not each of these must be convertible into a scarf. Hi Helen, thank you for taking the time to share your insight. Have a look at these articles writer for older women travellers: https://www.travelfashiongirl.com/over-40-fashion/ Hope this helps! Hi, what are women wearing for a night out (restaurants, bars) in London right now? It’s a weird in-between-seasons time (still cold at night) time, and packing is a challenge. 🙂 Thanks! I can’t decide between the 12 Ways Dress and the Encircled Chrysalis Cardi. The Cardi seems much more versatile (except for not having a skirt option), but after reading other reviews, is not very light and doesn’t dry quickly. Also it is a bit more expensive. The 12 ways according to your review is lightweight and dries quickly, but can’t be worn as a scarf, shawl, cardi etc. like the Cardi can. I am torn between the two. I guess I can forgo not having the scarf/shawl and Cardi option with the 12 ways as I can bring these items separately, but I just wanted your opinion regarding which of the two you would choose to travel with. I absolutely ADORE Diane Kroe’s entire line! I love how each piece flows away from the body and also the fact that my entire vacation wardrobe fits in my carry on! We love her too!!! Thanks for reading Jen! I absolutely love my convertible dress, and other travel pieces , by Dian Kroe. It fits and hugs every curve and it’s one of my go to dresses for all occasions. Diane’s line is amazing and is fabulous for all sizes. Being a girl with curves I feel her line is so versatile for all shapes and sizes. That’s awesome to hear Val! We love brands that make women feel comfortable and confident! Now obviously I have Diane Kroe’s convertible dress and I LOVE LOVE LOVE it! That’s awesome that you’ve found a brand that works so well for you! Happy travels Tegan! I am so glad the versalette is back! I ahve wanted one so bad! Just ordered. Their other products look amazing too. Got some olive leggings to boot. I am so glad the versalette is back! I have wanted one so bad! Just ordered. Their other products look amazing too. Got some olive leggings to boot. I wanted to add, that I’m really excited about it because I am a tall size 14-16 and I have the hardest time with a travel wardrobe. Any advice from others would be welcome! Asos has a great plus/cusp selection. H&M on the other hand, skips my size entirely. Also, travel pants are a huge problem. The Skylers I fell in love with on this site top out at size 10. Seriously guys? It’s like they don’t want to make money! Hi Crystal Thanks for your comment! I’m going to post your question on Facebook to see if we can get you some feedback on tall sizes 14-16 from the readers. Stay tuned! So, I’ve gone through my closet and found that the extremely familiar Dress #5 is the dress that I’ve been using as a shirt. It always seemed to long as a shirt and too short as a dress, so I’ve been tucking it in to everything. I got this at a thrift store, so I had no idea that it was this amazing piece. I was actually going to give it away in a week. I’m so glad that I found this and realized what its extent was. I’m never getting rid of it now. haha that’s great to hear! it helps to put it away for a trip or two. when you find it again it’s like finding a new treasure! The Bamboo made in the USA dresses from @TranquiliT are fantastic. Naturally wicking! I have the Infinity Dress and yes, I`ve worn it on a cruise and for the Holidays. The only problem I have when traveling is, that it is kinda of heavy when you`re limited on luggage weight. But then again it does offer you lots of opportunities. Would you recommend it to other travelers? Also, do the pros outweigh the cons? I looked into making one and you need a lot of fabric, fairly heavyweight. That’s one of the biggest things to consider with some clothing items. Does it transform into multiple pieces but take up twice as much space anyway or does it offer versatility and help cut back on the space? With that being said, my best travel dress was a maxi dress I hesitated to pack because it was so much fabric. However, I ended up wearing it all the time because it was pretty and comfortable and the fabric was really low maintenance. What it really comes down to is if you’re really going to wear the item of clothing all the time then it’s worth the space. I actually bought the infinity dress on amazon a while ago! Still need to figure out how to recreate all the different styles but I figure it’s the only dress/skirt I’ll bring on the trip so I will learn how to wear it as I go! These look like some nice dresses, especially the TwelveWays. One piece of clothing I really like the idea of is the Versalette by Revolution Apparel. But since they don’t ship worldwide yet I’ll have to wait forum next trip to the states. Hi Rosanna! Yes, I also love the look of the Versalette but didn’t think they were officially selling it yet? I can’t wait to get my own and combined with a few other pieces, it will sure get easier to travel with just 4 clothing pieces! Yeah, you’re right. They’re only shipping for the Kickstarter backers. But it’s gonna be a while before I’m stateside anyway, so hopefully they’ll be ready then.